A tad expensive back in the day but many many years later I finally got one. A few days ago, a friend of mine uploaded a picture of this months Retro Gamer Magazine which he gets early due to having a subscription (something i need to think about). It features Flashback:The Quest for Identity on the cover and as soon as i saw it I thought woohoo, I love that game! Maybe the article inside was prompted by news of the modern remake that’s currently in the making – sadly, only for Xbox 360 owners so that’s me out 😦 ). I must have played Flashback on my Amiga so many times that I doubt the floppy disks still have any data on them through wear! It’s a truly awesome game and back in the day, I’m guessing just like everyone else, was simply blown away by everything the game had to offer. It’s highly polished vector intro/cutscenes, big budget movie style soundtrack, rotoscoping and cyberpunk sci-fi visuals were like nothing that had come before since ‘Another World’. Usually these days, if I don’t have the Amiga on the desk then I’ll play Flashback on the Megadrive as the extra buttons on the controller can often come in handy instead of using stick/keyboard control likes on the Amiga. Still the Amiga was the first version I played it on and it’s on that platform that I’ll always consider Flashback as being my favourite. Flashback on the Amiga is four disks of happiness! Any…ho, after seeing that magazine cover , I thought I’d check out eBay to see if I could locate a copy of Flashback on the Panasonic 3DO. 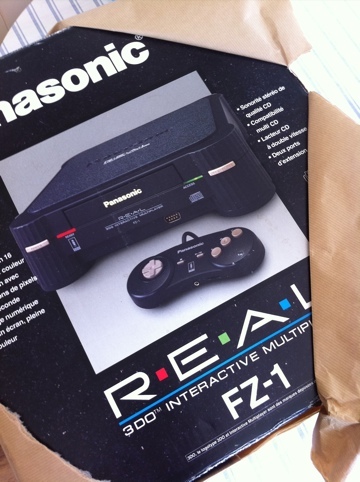 It’s been ages since I’ve had the ol’ FZ-1 out of its box and I’d heard that on the 3DO, Flashback is particularly good. Hmm, not sure about the top part of the cover though, the bottom half is very Bladerunner-esq so that’s gets a big thumbs up from me. After finding a copy of the game at a rather bargain Buy it Now price (semi-tatty box) it arrived this morning almost on cue after finishing the housework (Yup, jobs out the way first is the StiGGy way!). The familiar intro has had a bit of a makeover and is looking rather cool in its modern (for the time) 3D rendered guise. Good as it it, it does seems rather short though and I much prefer the original vector animation. On the flip side, the in game cutscenes are fantastic especially the charging station and scene were you meet Ian and sit in the chair to regain your lost memories…Conrad finally talks! I’m a bit of fan of the main menu music on the Amiga which simply rocks compared to the Megadrive and SNES version but on the 3DO, I think we have a contender for a new favourite here as it’s just superb. Maybe the other CD based consoles that have a Flashback port (Sega CD/CDI) are as good? Graphically, its seems pretty much about the same as the Amiga version far as I can tell and not really anything different..maybe a few extra frames of animation on the characters perhaps? Set up and ready to go. I was concerned at first that it might not run though as the CD was pretty scratched. So far so good although I apologise for the crappy picture, it’s a bit bright in here this afternoon. Right, come on Conrad, we’ve got a lot to do. 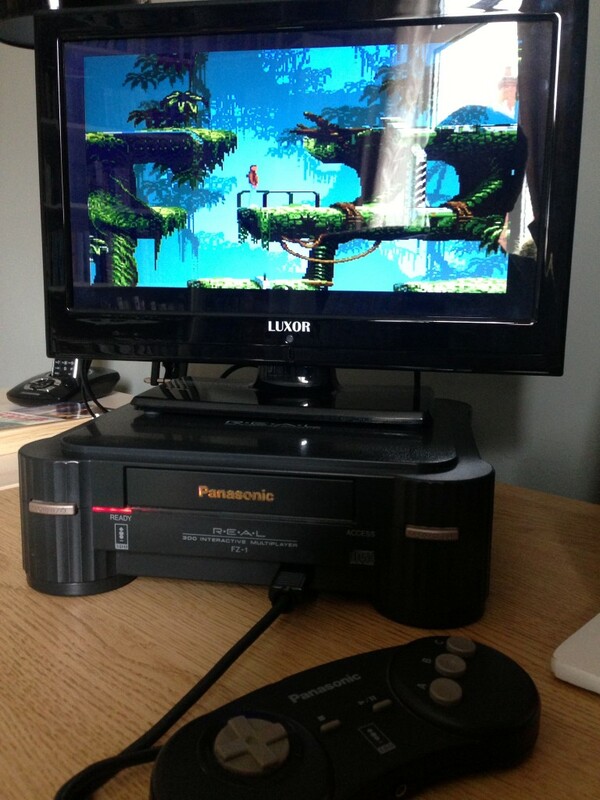 Well, I’m four levels in now and truely loving this port…I think even more so that the Amiga….shh, tell no one. I’m sure that if you have a Panasonic 3DO console you’ve already got this in your collection tucked neatly between RoadRash and Nighttrap (seriously! )…but if not, zip on over to eBay right now and see if you can track down this gem of a game. 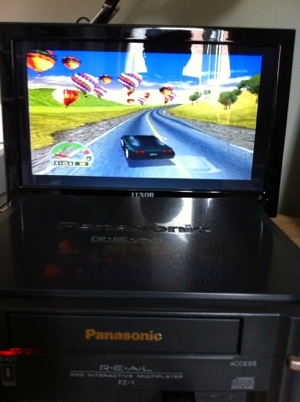 Panasonic 3DO hits the desk. It’s been a while since I’ve had my Panasonic 3DO out of it’s box and onto my geek desk and after months and months of 8-bit goodness and loading games from tape,disk and cartridge it’s about time I jumped ahead a few more years and dive into all things CD based for my retro gaming fix. 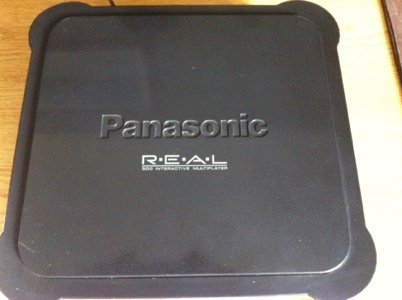 I’ve had my 3DO for about a year now and despite the trouble actually getting it delivered (see previous blog post if you want a laugh – https://stiggyblog.wordpress.com/2011/05/05/can-i-have-my-3do-please/ ) it’s rarely been out of it’s box and that’s a damn shame because just look at it…it’s looks truly awesome. Mine is the front loading FZ-1 model commonly found in Europe and to me it the best looking of all the variant out there (althought PSone-esq ‘Alive2’ model looks pretty good). However, back them and looking at those early tech demos it no wonder we craved it – Rendered intro sequences with copious amounts of marble, glass and chrome textures to dazzle us with and as many lens flares that we could take, full motion video and speech that contained whole conversations as opposed to the single lines of dodgy sampling, our existing Megadrive and SNES seemed to age practically overnight. I’m sold..want one….slight problem though…they’re HOW MUCH! That’ll be £399 then please sir! That’s Way way WAY too much to consider parting with for a games console with or without all the promotional hype. The same was true for many of my friends and knew, as with practically all new consoles, prices would fall once the initial boom was over. My friend Richard didn’t see it that way though and wanted one asap. In fact, Richard was quite lucky in the fact that he was much better off that the rest of us and so had been an early adopter of shiny new tech and, might i say was very generous in nature to share. Even so, £399 was still a lot of money and so, piling all of his available resources – aka his entire SNES collection (which would probably be worth four times as much today), it was sold for a pittance of the original cost but was just enough to get him a shiny new 3DO and a copy of Need for Speed. Need for Speed and this new console just blew us away. 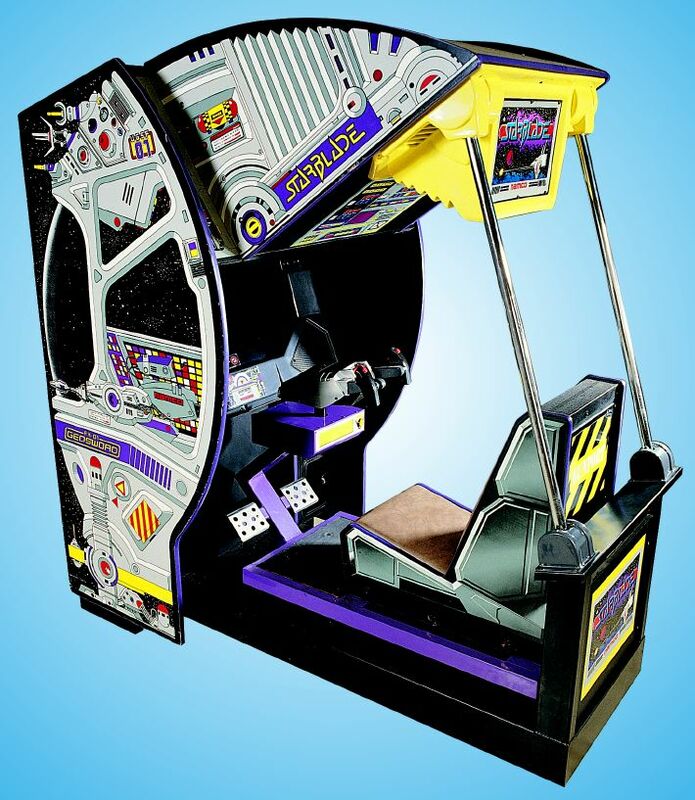 It’s car’s behaved with real physics and road handling (erm..o.k so back then it seemed like they did), tyre smoke that was actually ‘shock horror’ transparent and a highway that was beautiful and looked as close to the real thing that had ever appeared on a home console. It had all the good stuff that gamers and armchair racers had always hoped for.They seen trivial now but back then, having scenery that wasn’t repeated over and over again, a field of view that stretched out so far that you could see sections of the road you wouldn’t be driving on for a very long time, other vehicles that not only looked like real life vehicles but were varied in both shape and size and not simply the same model repeated over and over again. Drivers that hit the horn in rage if you cut them up or the clever and seemingly intelligent tactics used by your opponents car. I nearly wet myself the first time i saw a three car pile up created entirely at random by three cpu controlled cars. This was a living breathing world and it wasn’t solely my actions that created these scenarios. The list goes on and Need for Speed on the 3DO contained many many firsts for me. Despite this, I never did buy one. The bubble burst, the software list didn’t grow, the price didn’t come down and the nail in the coffin had to be Sega’s Saturn and shortly after that the all conquering Playstation. ..but now I’ve got one, take of the rose tinted glasses and see if it can entertain. 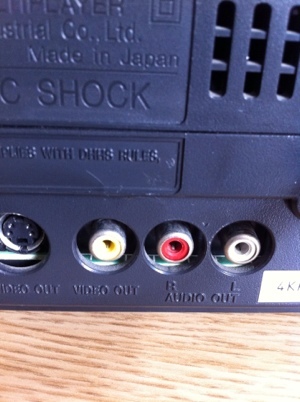 and it’s a great start too, no more blurred looking tv screen any more, this things got component sockets!. 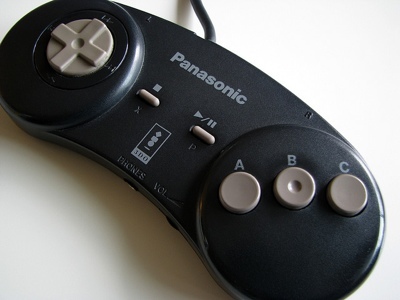 It’s joypad is the same shape as the very comfortable Nintendo SNES controller (only bested by the Sony’s Dual Shock in my opinion) and contains two rather handy features to accompany it’s high tech design. The first is the inclusion of another joystick port on the controller itself rather than on the console. This allows you to daisychain multiple controllers together for en mass multiplayer mayhem (or a right loaded of knotted controller cables :)) The second feature is a rather handy-dandy headphone socket and volume control. No more hoping that the headphone lead will stretch all the way to the TV, simply plug into the controller and off you go…although not great for more than more player I presume? So what of the games….well, as I’m still fairly new to the 3DO, my collection is rather small at the moment and therefore would love to hear your recommendations…but until then, I’ve got tyre smoke to create…did i mention it was tranparent?…amazing! Can I have my 3DO please? At one point it became almost comical! I was actually hoping that To recieve the console prior to the Easter break but alas no. Maybe I’m a little impatient here but tracking information advised the parcel was at my local depot two days before Easter. Sadly, I’d missed the delivery attempt after Easter due to being at work (by only 15 mins according to the failed delivery slip posted through my door). Although not very clear on instructions, the failed delivery slip listed a website and automated telephone number to arrange a redelivery attempt or collection at the depot. Rather than miss another delivery I thought it best that I collect directly from the depot. The first problem I encountered was the ref no. on the failed delivery slip appeared to be invalid according to the website! I must have spent at least an hour wrestling with the website. In the end I tried the telephone number in the event that I’d get to speak to a real person and explain my predicament. Sadly, if was an automatic system and like the website said my tracking number was invalid. So here I am with no item, no way of knowing where it was and no contact information. The next day I hit the Internet and pretty much from the 2nd hit on Google it looked like this was such a common and downright annoying problem that so many customers had had with this courier. Further surfing resulting in a rather interesting telephone ‘hack’ that allowed callers to bypass their automated telephone system and be put through to an operator….I kid you not! Well, I tried it and would you believe it, it worked and was connected to real person. After a few minutes my triumphant joy again returned to dismay as the operator announced that they had no reference to any parcel under my consignment number and no reference of any deliveries bound for my address. Surely that’s wrong I said and pointed out that I’d even received a failed delivery slip throughout my door. The operator replied that the delivery was probably for another address and the driver had mistakenly posted the slip through my letter box by mistake. Rather angrily I replied ‘so how come it’s got my surname on it then?’ and her reply was ‘errrrmmm’! I ‘politely’ asked her to search through her records again and this time, low and behold she located my delivery. It’s at the local delivery she announced so I said I’d like to arrange to pick it up. She said that that would be a problem as the item was due to be shipped again the next day. At this stage I had no choice but to book a day off work and wait in for the delivery. Back on the phone, I had to go through the same routine of ‘I can’t find any record of you consignment’ pantomime again before we got to the bottom of why I didn’t receive my item this time. His answer, although rather apologetic was that the previous operator had misread the details on screen and no redelivery was scheduled. As you can imagine, this is becoming somewhat frustrating! Any-ho, we arranged that I would collect the item from my local depot (well, a 30 mile round trip to the depot) the next day. The next day came, I checked that i had sufficient identification/proof of address and eagerly set off to the depot during my lunchbreak. When I arrived, the despatch officer said that, according to their records, I wasn’t due to collect the item until the next day and that the item ‘wasn’t ready for collection’. As you can imagine, I hit the roof. Once I’d climb down out of my tree I explained in great detail all of the problems I’d encountered so far and demanded that they stop wasting my time and go get my *** parcel. After half an hour looking through the depot the despatch officer said that she couldn’t find it and that it might still be on the lorry. I asked to see the depot manager and again explained my situation. I also cautioned him not to use the words ‘maybe’,’probably’ and ‘could be’. He went very red. After another round of apologises from him he said that there really wasn’t much he could do but take my telephone number and contact me later in the evening after another depot search that afternoon. Grudgingly, I went back to work empty handed. The next day was the wedding of HRH Prince William & Kate Middleton and therefore the depot was shut. The next day (now two weeks after the item was shipped) I drove down to the depot again determined not to leave empty handed. from this whole silly game came out. I roared and the depot manager went red again. I also suggested that he rolled up his sleeves, gets out into the depot and start looking. After over an hour, he came back looking rather worried and said that there had yet again been another mistake. Instead of placing my parcel (it was found earlier in the day) in the area awaiting customer collection, it was placed in the area due for redelivery. The depot manager was now wobbling like jelly and raced to the office to try and contact the driver by phone. Sadly, the driver wasn’t answering his phone and thus I once again was leaving empty handed. The depot manager said as I left that he would continue to try and get hold of the driver and tell him that I’m on my way home. See me racing through city centre traffic on a busy Saturday afternoon. I arrived home and headed for the letter box. Great no parcel, I’ve won the race to get home before the courier arrived. All I need to do is sit tight and wait. Hold on, what’s that on the floor? It was another failed delivery slip with today’s date on it. Hear me ROAR! I flipped the slip over and in my anger hadn’t seen the hand written note at the bottom saying that my item had been left with a neighbour! Could it be true? Was it some sick joke? Was I dreaming? See we race to our neighbours house. She brought the item out for me. See me jump in the air hollering and pumping fist….see neighbour slowly backing away. Back home, I couldn’t bare to open it. What if after all of this hassle it’s the wrong item….or it’s broken? 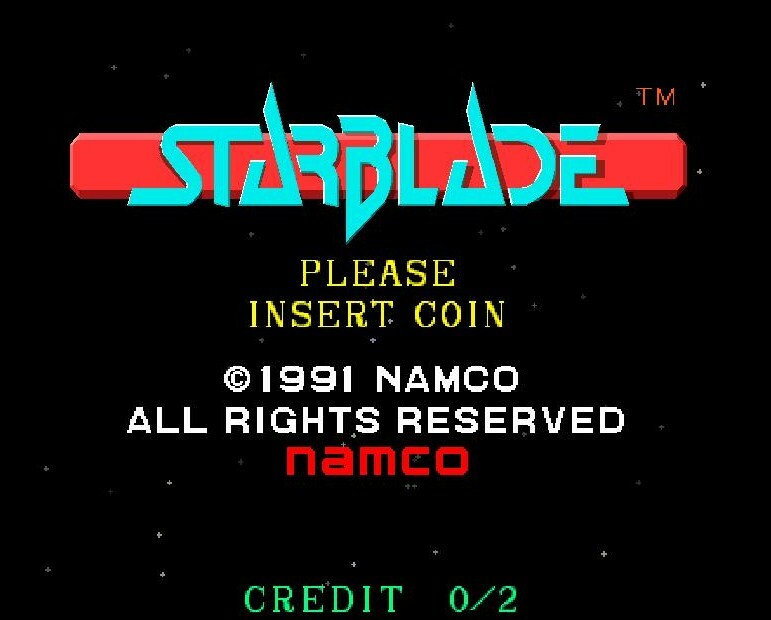 Namco’s brilliant shoot ’em up StarBlade was one of those amazing arcade games that sadly I’d didn’t give too much attention when it appeared in the arcades. I seem to recall seeing that huge cabinet only once on the east coast were we used to holiday and being bowled over my the amazing graphics that was reminiscent of the 1984 film The Last Starfighter. However, credit was very high to play, so I always opted for the games that I was good at to stretch my coins as far as possible. Fast forward almost twenty years and I’d completely forgot all about it. That was, until a member of the Retro Computer Museum had posted an article about his own Panasonic 3Do console collection including the home conversion of Starblade. Seeing those screenshots brought it all back and I trawled through YouTube videos soaking up this gaming gem. 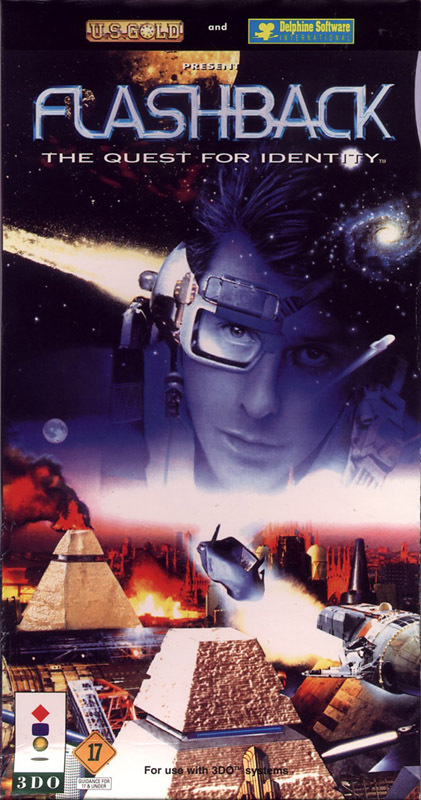 At last months RCM Gaming Event (see post https://stiggyblog.wordpress.com/2010/05/17/retro-computer-museum-gaming-event-may10/ ) a 3Do had been setup and with a selection of games were on offer to play including the home port of Starblade dubbed Starblade Alpha. 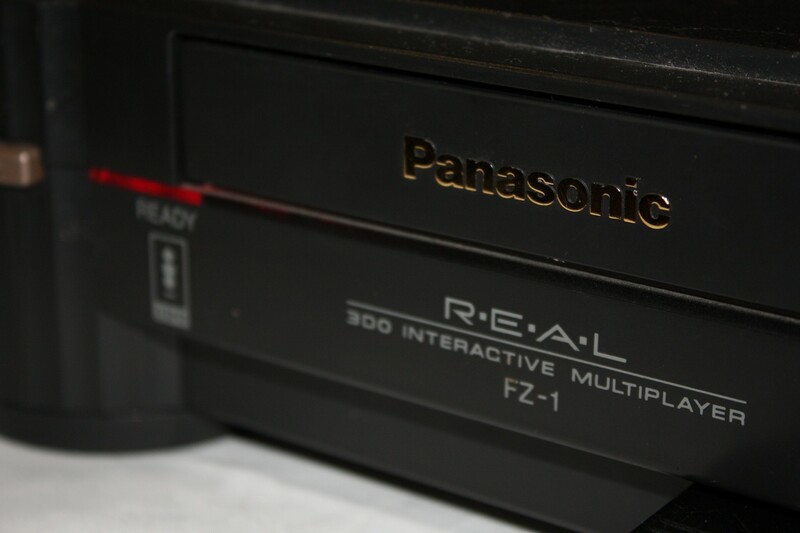 The Panasonic 3Do (and Sony Playstation) conversions are absolutely brilliant and looked to be almost on par with the original. I played it for hours as well as the hilariously funny Road Rash. 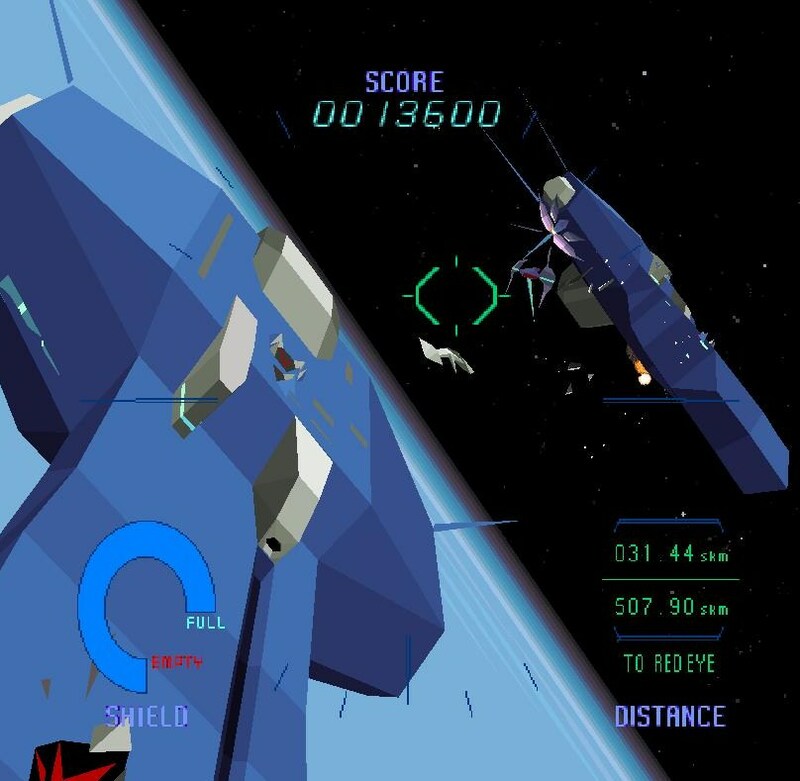 As well as the flat polygon look of the original arcade game , the 3DO (and again the Playstation) versions contained an enhanced version, adding rich textured polygons. This really does make everything look extremely good but to be honest, I think I prefer the original ‘Tron’ look. -Alpha version with added textures. I’d never owned a 3DO before but a friend of mine had brought a year or so after release and was impressed with EA’s Need for Speed when I first saw it. Back then, I had considered getting one myself but with the Sony Playstation was soon to be released and seeing early preview shots of titles like WipeOut & Ridge Racer I’d decided to hold off. 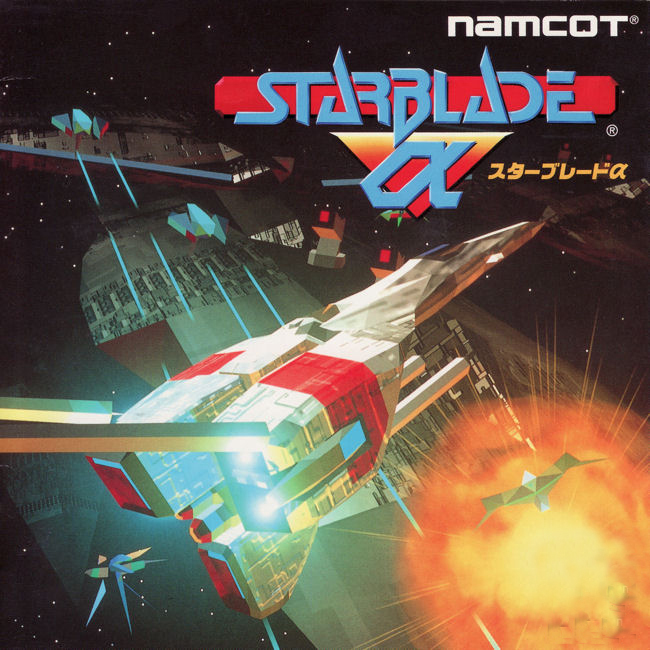 A few weeks ago I was browsing eBay and found one for sale (front loading version) and as a bonus, it happened to have a copy of Starblade included – sadly, without the game box though. I’m really enjoying it and hope to increase my software collection soon. As a good as the 3DO conversion is, I still long to play the original arcade version. Emulation via MAME isn’t particularly good but after a little research online, I found a derivative of Mame that has been written to emulate Namco System 21 arcade boards. On my first attempt, I couldn’t getting it working as some of the required files were missing. On closer inspection, I did indeed have the correct files, they were simply named incorrectly. 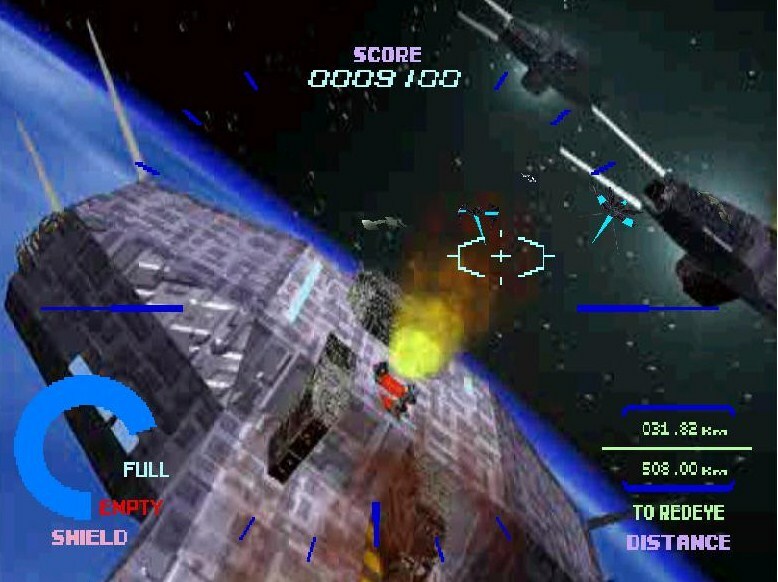 One I’d renamed the files, StarBlade loaded and looked awesome compared to the 3DO version. Controls were a little bit iffy but thankfully the emulator supported MAME command line options so I wrote a configuration file that allowed me to utilise my PC analogue flight stick. With this configured, gameplay is much better and probably as close as I can get to original. I’ve uploaded a short video of me playing the first two scenes on my PC. It looks great on my PC monitor, bet it would look even better on a projector!